Hi, everyone! My grandma asked me to stop by and introduce myself to her blogging world of friends. Grandma had been asked not to mention me to all of you up until now. My family just got pictures of me a few days ago and now grandma has been given permission to let the cat out of the bag and to post my picture. I am Pooh Bears new sibling!﻿ Now, you know why grandma has all this interst in giveaways for baby stuff. Grandma says stay tuned for more fun and family friendly giveaways! I will be back soon and we can talk some more! Aww CONGRATULATIONS Grandma!! What a blessing! 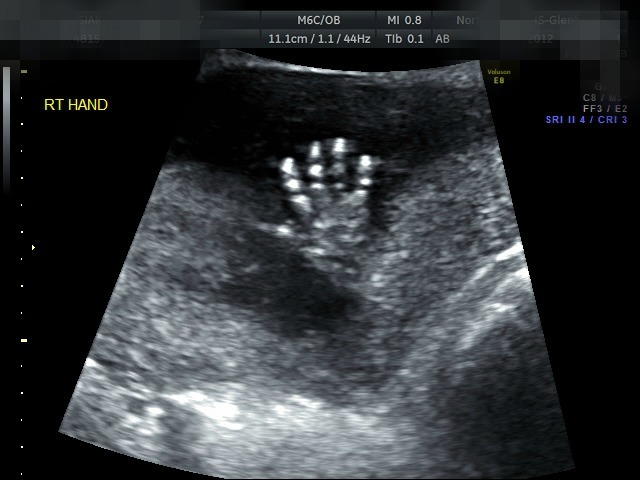 And such a cute little hand too! Congratulations! Aw so cute even waving Hi!!! Congrats! :) Is it a boy or a girl? Oh my gosh I am so excited for everyone. I'll be on the lookout for baby review opportunities. Congrats I love babies. Awwww that's so cute. Congratulations Grandma! Isn't that fantastic, such joy to come.